You’d be hard pressed to find a single offroad traveller who hasn’t heard of Australian Off Road (AOR). From humble beginnings to a manufacturing powerhouse, AOR has taken the offroad market by storm. In a one-on-one interview with general manager, Russel Evans, CTA gets the inside scoop on how AOR is run, how far it has come and how it’s competing an increasingly dense market and low price point imports. CTA: How did AOR come to be? AOR: Steve Budden started the company in his back shed. 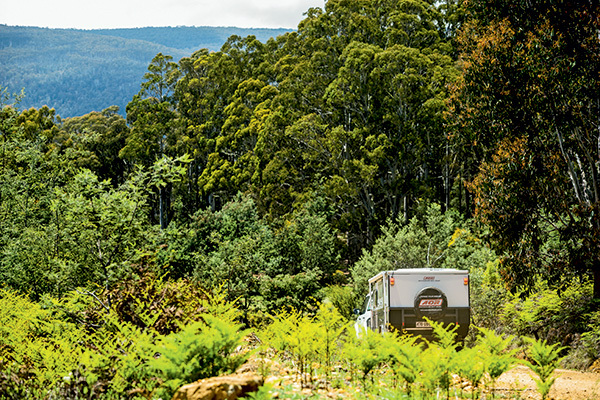 He had a camper trailer hire business at the time and had become increasingly frustrated with campers regularly coming back damaged, so he decided he could make one that was better, more durable and stronger. He built the first trailer and the rest is history. He had made about 800 by the time he stopped building them. CTA: AOR is a household name now and you’ve been around for a while, exactly how big is AOR? 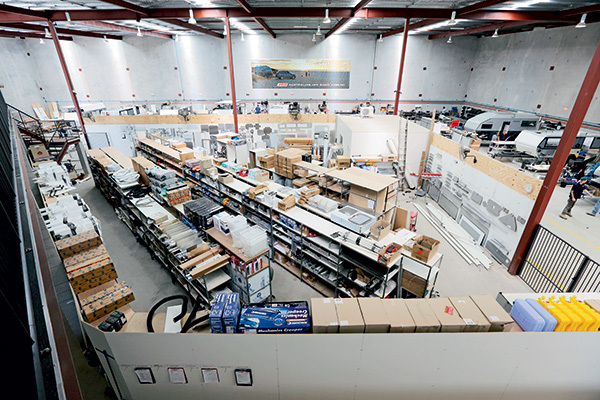 AOR: We’re on 5000m2 here at the factory, which was custom-built and has around 80 employees. 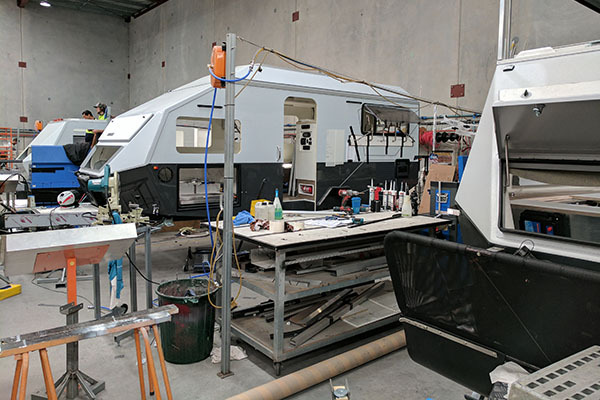 We’ve got really strong marketing and admin departments, our welding shop has around six people and we do our own fibreglass bodies with about 12 people in the fibreglass department as well. All up we operate with nine build lines and whilst the trailers take a few months to build, we finish one every 1.7 days. CTA: What are some of the key features that make AOR models stand out from the pack? AOR: Based on what customers are telling us, design. Steve is a very clever man and has very clear principles around how he designs the trailers. Simple rules like ensuring they track the same as the vehicle and are no wider than the vehicle, so anywhere you can take the car you can take the trailer. He’s serious about design and simplicity. He tries not to put anything automated onto the trailers. We’ve still got a standard roof lifting mechanism where you lift the roof and pull it down yourself, we don’t put electric motors on because people take these offroad to really remote places and the last thing you want is an electric motor to fail and you can’t get your roof down. Our trailers really are an extension of the original campers. A lot of innovation comes from our customers, too; they’ll talk to us about ideas and because they know the product and the terrain they get taken on, we take their input seriously. If they’re good idea’s they get included in our R&D discussions and sometimes in the design of the trailer. CTA: AOR has always positioned itself in the pointy end of the market, is it ever tempting to break into the budget end? AOR: No. I think the budget end requires a completely different skill set to what we have, and it’d be really hard to adjust our business model. Steve’s got really strong values in the way he makes decisions about the trailers and over the years we’ve developed the same characteristics in our staff. Our sales are that strong we don’t want to take our eye off the ball in terms of what we’re doing. We don’t want to play a game where we compete on price, we’d rather compete on quality, features and benefits. CTA: As an Australian manufacturer, how do you see the future of the industry? AOR: I can only speak for us, but the future is pretty bright. We’ve got really strong sales, we’ve only got a few positions available for 2017 delivery and we’re already selling spots for 2018, so from a sales perspective we’re really strong. From a manufacturing perspective it all comes down to making sure you’ve got good procedures and good systems, a good management team and a strong supply chain. If you can be working on all those principles and utilise machinery as much as you can in the workshops there’s no reason we can’t keep it here. A lot of the people who buy our trailers want Australian made. In the market we play in people come in and do the factory tours, they want to see the chassis get made, they want to see Australian workmanship on the trailer they’re purchasing. It’s a really important part of the buyer’s experience. While that’s there I think we can continue to compete in manufacturing. CTA: When you get customers completely new to the lifestyle what advice do you generally give them? AOR: One thing we’ve started to do is introduce advice from the specialists on where people can travel, we run seminars in each state and get guest speakers in to talk about where people can go, what to expect, all those sort of things. One of the big things that helps our new owners is we have an online forum. All the people who own AOR trailers have access to that forum and they all talk to each other. They talk about how to maintain them, how best to utilise them, but they also talk about the best places to take them and how to get there. Our business model isn’t just about selling trailers, there’s a big community aspect too. AOR owners run rallies in each state and you’ll see 30, 40, even 50 AOR campers all turn up to these events. Our business model is more than just manufacturing – it’s really an overarching experience. CTA: You’ve obviously got a lot of staff at AOR, do your crew get out there and use these campers? AOR: We try to get out there as much as we can. It’s a bit like a mechanic who always has the worst car, we’re normally so busy we probably don’t do it as much as we’d like. Steve goes out there and tests trailers himself and we try to get other people doing it, too, even a lot of customers. We have a lot of existing customers involved in things like that, and representing us at shows. Steve goes for a couple of months every now and then, and went away about four times last year, the bugger! 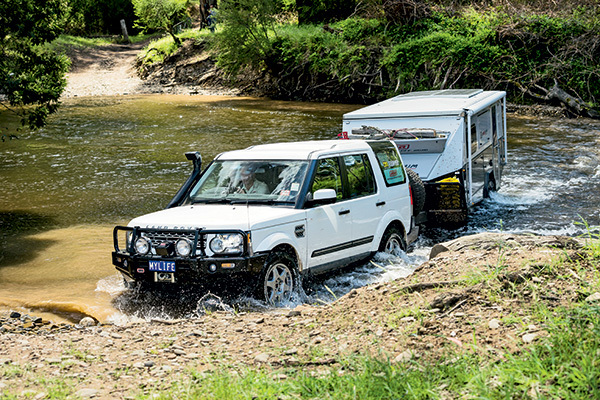 CTA: There are six models of AOR trailer, from huge double-axle offroad vans to the lightweight Odyssey 2. Out of all of them, what would be your go-to for long trips? AOR: I like the Quantum Plus. Steve and I sat down about two or three years ago and said how are we going to make the company stronger and at that point in time the Quantum was probably our major seller. The building of a more diverse range of products is probably where a lot of the recent strengths of the company come from. We virtually sell an even number of every model, every month, and we’ve gone from being dependent on one model to now not being dependent on any of the models. The good thing about the Quantum Plus is it’s quite roomy. 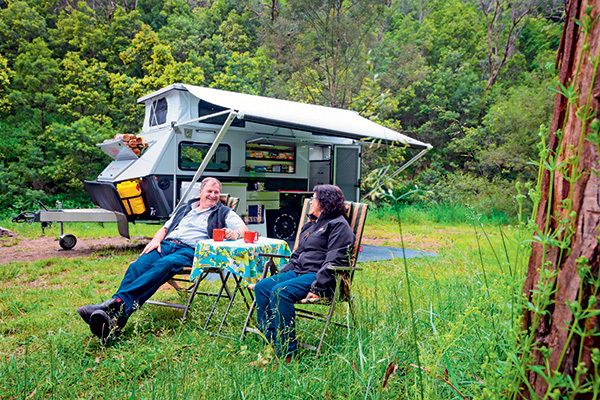 It’s got all the characteristics of the Quantum – it’s an outside cooking trailer, with a really good inside layout with a good sized pantry and storage. But it’s got enough space that it’s just that little bit more comfortable. It’s only about 50kg heavier and 600mm longer than the Quantum, but it’s amazing the difference it makes inside, so it’s my pick for long trips. To be honest though, I’d happily take any of them. CTA: You’re predominantly a large caravan builder, do you see much future in the smaller offroad side of things for AOR? AOR: We’ve just released the Odyssey 2. It’s interesting, normally when we release a trailer it takes 12 months of showing before the market really takes it up and you start getting the sales you expected. You’ve got to take them around the country, take them to all the shows so everyone gets to see them. The Odyssey started selling from the time we showed it at the first show. We will have sold more Odysseys in the first 12 months than any other trailer we’ve ever released, so yes, I think that does show the potential of the slightly smaller market. In saying that, though, all our other models have increased in sales as well. CTA: AOR prides itself on having some of the biggest firsts in camper trailers, is there anything else on the horizon people should be excited about? AOR: To be honest most of the stuff we’re looking at the moment is already in the market, we’re only making little tweaks to the models coming through. We are, however, constantly looking at our grey water and recycled water systems, something that’s going to continue growing in Australia. It’s going to become more and more difficult to just dump grey water on the ground so we’ve got some water solutions coming soon that will be pretty exciting. The way we’re trying to build it is so they can be retrofitted. It depends on which models we talk about, though, because they all depend on certain chassis designs. We do try to do things in a way that things can be retrofitted, a lot of our customers want the new features as soon as they’re out. It’s a way we avoid interrupting the sales cycle too because people can be confident to buy now and know they’re not going to miss out on future initiatives because it can be added to their trailer at a later date.